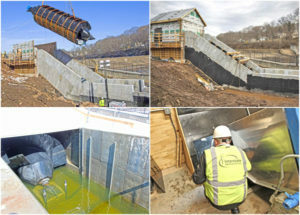 Hanover Pond Dam in Meriden, Connecticut is generating power again for the first time in decades, using an ancient technology never before used in the U.S. Meriden is home to the first Archimedes hydro-generation screw in the country. Interstate designed and built the electrical elements of the project. About two years ago, Interstate took the idea from concept to a drafting design to a final design approved with the City of Meriden — and then took that electrical design and built it over the last eight months. The end result is a 220 kilowatt generation system that sends its electricity right back to the city of Meriden, enough electricity to power up to 100 homes a year. Ancient Greeks and Egyptians used Archimedes screws to move water thousands of years ago. In more recent centuries, they were used in the Netherlands to make the land dry enough to be inhabitable. Over the past decade or so, Archimedes screws have become increasingly common throughout Europe to generate power. With the Meriden installation, the technology has reached the U.S, with more installations in the planning stages throughout the country. Archimedes screw technology is driven by the force of water controlled through a series of programmable points and sensors that report how much water is available, how much water can be allowed to flow through it, using the weight of the water to turn the screw. Thousands of sensors are seamlessly integrated into the electrical design that Interstate developed. In addition, as part of the electrical scope, Interstate installed a 400 amp electrical switchgear line up to handle the power generated by the screw, variable frequency motor controls for the rate of revolution and coordinated with the complex Spanns system. The vast controls system allows the PLC’s (programmable logic controller) to know the water level in the pond, the flow rate of the water in the sluiceway and the pressure of water on the screw. All of these controls and sensors work in harmony and enable the system to operate unsupervised. Interstate also installed an emergency generator to supply power to the electrical gear in the event or a failure or interruption in power generation. Fish and wildlife are protected by the Archimedes screw because it is forty feet long and turns at such a slow speed that it has a minimal impact on the environment. Spawning fish are able to make it safely through the channel. And with each slow and gentle turn, more clean electricity is generated for Meriden.